Are you an astrophotographer? Do you like to share the outcome of your hard work with others? As an astrophotographer myself, and a subscriber to numerous Astrophotography forums, I have found that the Internet is lacking a centralized place where astrophotographers can share their work. Well, this is finally over! AstroBin comes to fill the gap. 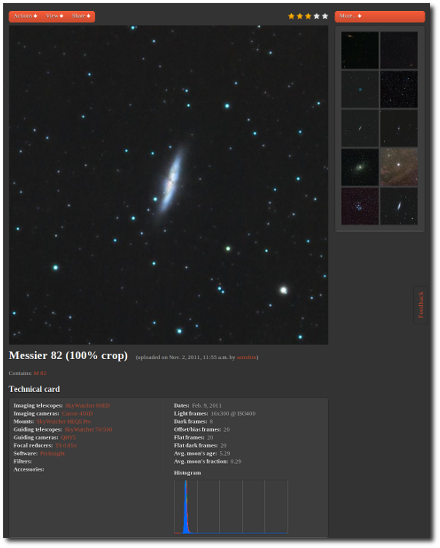 It's a website built from the ground up by an astrophotographer, and it provides means to people who want to share their astrophotographs. So how is this different from any other image sharing websites? On a general purpose image sharing site, you would upload your image and be done with it. AstroBin, instead, has a user interface specifically designed to enable you to input all the technical data of your image. AstroBin will autocomplete your input using a vast database: everything from telescopes, CCDs and filters to astronomical objects in many catalogues will show in popup dialogs for easy selection when you start typing their names. AstroBin is connected to the SIMBAD Astronomical Database, which contains over 5 million objects under over 15 million names! On AstroBin, astronomical subjects have their own page, where you can see the best images of them, and plots and charts showing trends and interesting statistics. There is also a page that shows the most popular subjects organized by month and latitude! Have you ever wanted to see how your next image is going to look like? On AstroBin, you can search for all images of a certain target that were taken with a certain telescope and a certain CCD or camera. Or a certain filter. How about all the images between 6 and 8 hours of integration? Or with a certain Moon phase? You can do that! AstroBin can help you with your next telescope or camera purchase, by searching for gear combinations owned by other users. For instance, you could search for all images taken with a Canon 5D and any apochromatic refractor, or a SBIG ST-8300 with any Richtey-Chretien telescope. Or, if you want, you can search by telescope diameter too! Finally, all this information is collected in interesting plots, that can help you figure out how some gear items are trending. Each image on AstroBin is annotated of all the technical details about its acquisition. Telescopes involved, cameras, mounts, filters, everything is visible at a glance in the Technical Card. Even the Moon age at the time of the acquisition is displayed. 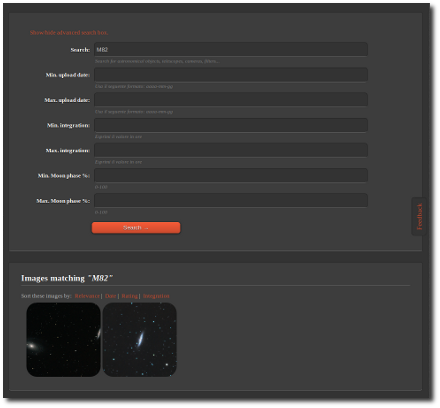 AstroBin will do more than just host a copy of your image: when you upload a photograph, a histogram and a black & white inverted version of the image will be generated on the fly, so it's easier to spot faint nebulosity regions or spiral arms. Images will also be plate solved, and an annotated version will appear on the site. AstroBin will know what are the astronomical objects in your image without you telling! AstroBin's upload wizard will offer you to watermark your image with the text of your choosing. All it takes is a click! Don't tell me you have never gone back to revise the processing of an image after you had published it. AstroBin embraces this concept and lets you publish several revisions of the same image easily and intuitively! Now it's going to be really easy to tell whether your processing has improved. On AstroBin you can message other astrophotographer, follow them and be notified when they post new images, or perform requests for more data. You can follow gear items or astronomical subjects, and be notified whenever there's a new image from a certain CCD, or telescope, or filter, and so on. 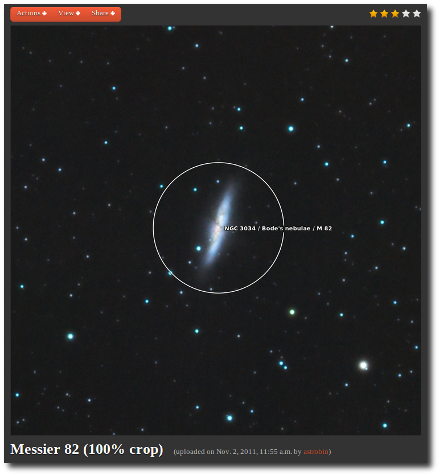 Or you can monitor all the new images of a certain galaxy or nebula. As you have undoubtly realized by now, AstroBin is way more than an image hosting service. It's what the Astrophotography community has needed for a long time. For years, I have seen amazing images scattered all over the Internet: general purpose image hosting sites, forums, personal websites and even temporary places. Some of those images contain data that is too precious to go wasted in a sea of chaos. AstroBin comes to the rescue to provide a home and a central hub for astrophotographers all over the world. So, what are you waiting for? Sign up now!